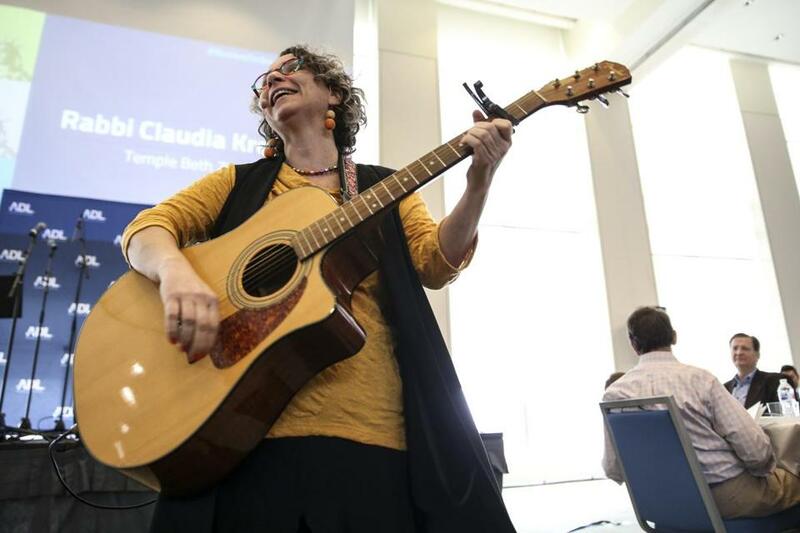 Rabbi Claudia Kreiman of Temple Beth Zion sang at the Anti-Defamation League’s 12th annual “Nation of Immigrants” community seder at UMass Boston on Sunday afternoon. While a nation awaited the findings of Special Counsel Robert Mueller’s investigation into possible Russian tampering with the US election — a development that threatened to further fracture an already divided nation — the message inside a sprawling ballroom Sunday afternoon was one of kindness and inclusion. The goal of the Anti-Defamation League’s 12th annual “Nation of Immigrants” community seder — which drew some 400 people to the UMass Boston Campus Center — was to promote strength of diversity, as well as humane immigration policies. But in an era of heated political rhetoric and anti-immigrant sentiment, organizers said, the event also served as a reminder of the work still to be done. “We recognize that the journey is ongoing and incomplete for so many people, including thousands of people in Massachusetts and across the country who still live in fear, or don’t have access to health care or security,” said ADL New England regional director Robert Trestan, one of the event’s speakers. One by one Sunday, a collection of speakers took turns on stage — among them Cardinal Seán O’Malley, who served as the event’s keynote speaker. Others to speak included Eva Millona, executive director of the Massachusetts Immigrant and Refugee Advocacy Coalition, along with Rabbi Claudia Kreiman of Temple Beth Zion, and Cambridge Mayor Marc McGovern. 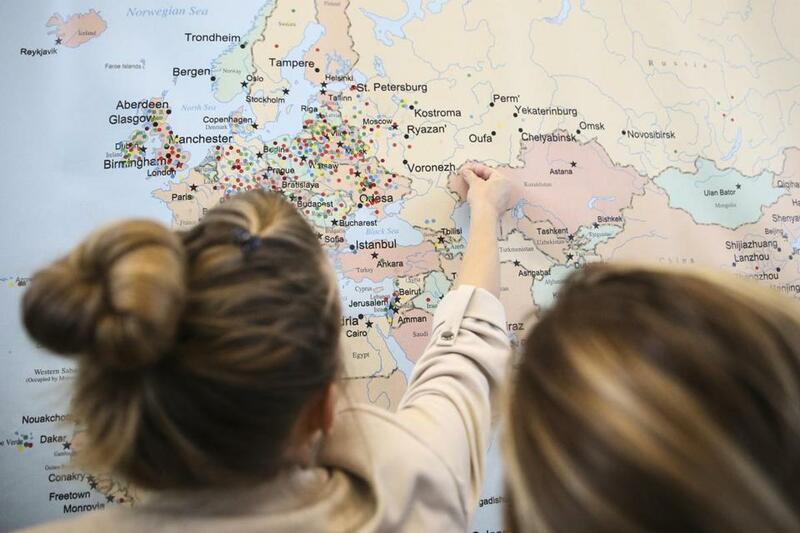 Attendees placed markers on a map indicating where their ancestors came from. Representative Ayanna Pressley, Democrat of Boston, was scheduled to speak but was forced to cancel because of a recent leg injury, officials said. During the course of the two-hour event, the nation’s current political climate — which has seen a rash of anti-immigration sentiment and a rise in hate crime — was never far from mind. Last November, for instance, the FBI announced a 17 percent rise in hate crimes in 2017 — including a 37 percent jump in anti-Jewish hate crimes. Massachusetts has seen a barrage of racially and religouslycharged incidents in recent years, including one last week in which police in Fall River opened a hate crime investigation after several gravestones at the Hebrew Cemetery were vandalized with anti-Semitic graffiti. According to reports, phrases like “heil Hitler” and “This is MAGA country” were written on gravestones in black magic marker. Several other gravestones were overturned, officials said. The call to action was a message that reverberated through Sunday’s event, and multiple speakers shared their own stories of arriving in America as immigrants. Guests, meanwhile, were invited to sign cards urging state legislators to consider four pieces of pro-immigration legislation. Organizers planned to mail the letters to state officials Monday morning. But more than anything, Trestan hoped the event would serve as a kind of call to action. 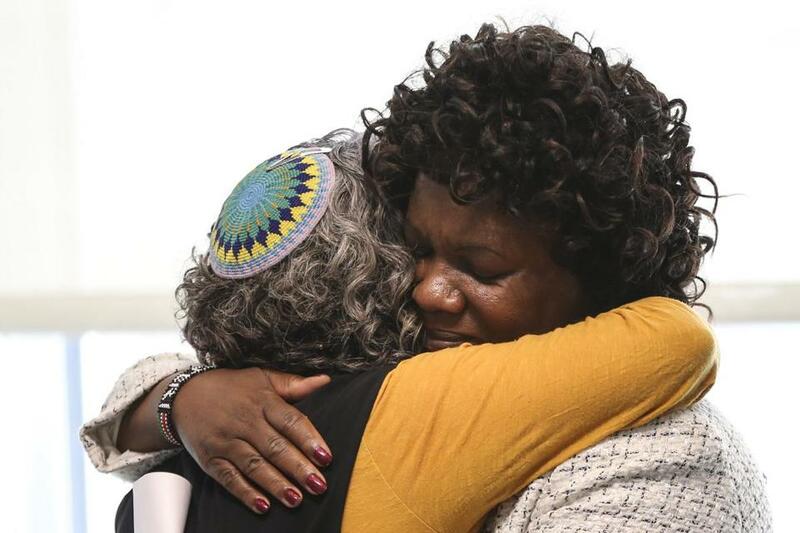 Esther Karinge, who was born in Kenya, hugged Rabbi Kreiman during the seder.